Spode Aesops Fables China - 10 items found. Lovely shape of dish from the dessert service. Backstamp: The Dog and The Shadow Aesops Fables Spode and printed and impressed Copeland & Garrett New Blanche. A few minor blemishes, a little wear to the outer rim and a little wear and discolouration underneath to the foot, overall excellent condition. The Spode Blue Room Collection Traditions Series. As new. Lovely plate in this series. Backstamp: Copeland Late Spode, impressed Copeland Crown and date for July 1911. A little minor surface scratching otherwise excellent condition. Lovely octagonal plate. 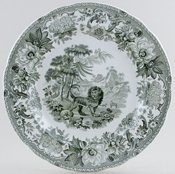 Backstamp: printed The Lion The Bear & The Fox Aesops Fables SPODE and impressed SPODE. Fine all over crazing with some discolouration although this is mainly on the back and faint hairline from rim. On display looks fine with good shine to glaze. A lovely stand and one cannot help but feel sorry for the lion when looking at the expression on his face! Backstamp: The Fox and The Sick Lion Aesops Fables Spode and impressed Spode. It has surface scratching and a little pitting and discolouration to the rim. To the face there are a few blemishes and underneath a little light discolouration. Oh dear, this sounds awful, but it is in fact a lovely piece. Introduced in 1830s the designs for this series were taken from illustrations used in the 1793 edition of the Reverend Samual Croxall's Fables of Aesops. This is the bowl from the ewer and bowl set, but is a lovely piece on its own. It has light all over crazing and a little minor surface scratching inside to the base, otherwise excellent condition. A small wash bowl decorated with a scene from this popular series. Backstamp: typical blue printed cartouche with The Fox and the Sick Lion and Aesop's Fables and impressed Copeland crown mark. Impressed date code for September 1921. Paper lables The Pulver Collection and number 113 and Pulver Exhibition of Blue Printed Pottery, Church House Farm Museum, September 7th 1974. By repute this bowl was also loaned and displayed at the Spode Museum. The glaze is finely crazed, but otherwise in excellent condition, bright and clean. Gorgeous plate printed in a subtle shade of green. 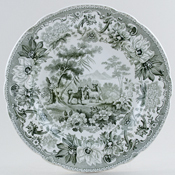 Backstamp: The Dog and The Sheep Aesops Fables Spode and impressed Spode 19. Light all over crazing and on the back a little very minor wear and discolouration, overall excellent condition. Lovely plate printed in a subtle shade of green. Backstamp: The Fox and The Lion Aesops Fables Spode and impressed Spode 30. Light all over crazing with some surface scratching. to the lower rim there is a pale streak where the transfer tor as it was applied.